St. John the Theologian was the last of the Evangelists to write his gospel, and wrote three general Epistles, and the Book of Revelation. 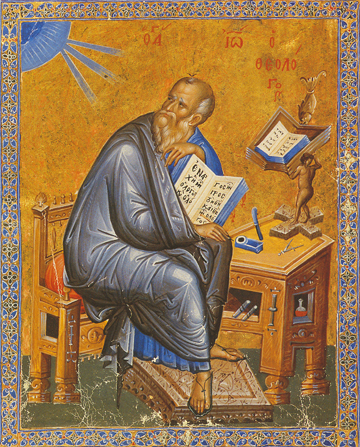 He is shown in this icon looking up to Heaven for inspiration in his writing, which abundantly came as is so evident when we read those God-inspired words in everything he wrote. St. John was young when called from being a fisherman, with his father Zebedee and his brother James, to becoming a fisher of men. He saw many blessed things with St. James and St. Peter that the other Apostles did not, such as the Holy Transfiguration of Christ on Tabor, and the Agony in the Garden of Gethsemane. He leaned on His Master’s breast at the Passover meal the night that He was betrayed by Judas, and stood at the foot of the Cross with the Virgin Mary when Christ suffered and died for our sins, while the other Disciples were hiding. Sent to Asia Minor to preach the Gospel with the Deacon Prochorus, he converted many to the Faith by his miracles and prayer, and by the living icon of Christ that he showed forth. He was boiled in oil, but kept unharmed, and died a natural death in great old age in about the year a.d. 100.